Full sources for TinyPTC by Gaffer can be found at SourceForge. That's a complete package including an SDL solution. I'm not a member at the O2 Basic forum nor do I plan to be one, so this hint here may help you proceed with your Julia Rings project there. The fractal animation is very spectacular and neat indeed. Thanks for the nice find. That should get me back up an running again. I haven't seen any other submissions so the fractal top gun prize still stands. Got it working and it's runs great. I wonder if this is the first ever 64 bit version? But I'm afraid there was something like that done in QB64. and the source and executable are here in case anybody is interested. I tried yours under Wine and it ran smoothly and produce gorgeous fractals. The C BASIC version seems to be running too fast to appreciate the fractals being generated. I think allowing the screen to be resized and adjust speed would be two nice improvements. Full screen works for me under Ubuntu. The main window is resizable in Windows also by dragging any corner or side so I guess it should work the same in Wine too. And yes, the original implementation relies on a tight events loop and overloads the CPU. That's why I decided to move it to interpreted BASIC to slow down the phase change a bit. Alternatively, a hi-res timer adjustable within 30 to 60FPS may be used to control the animation speed. The use of timer will also bring down the CPU load to about 2 to 5 per cent. There was no extra effort to do this right with the C BASIC version. You did a nice job with the FBSL version and in my mind wins the top gun prize. As Mike is leaving the podium after accepting his prize, a last minute development snatched the first place honors and Mike ended up taking second prize. A fair fight none the less. Charles' OpenGL is certainly a killer though I'd suggest using "glCopyTexSubImage2D" to update the texture instead of re-creating it from scratch in every frame. This would bring down the number of OpenGL state changes dramatically and increase the FPS rate accordingly. Nonetheless his first prize is clearly a well-deserved decision. 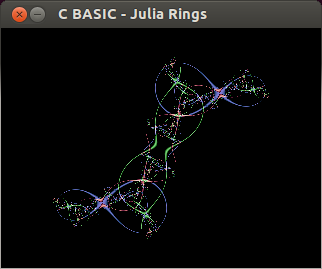 I think you and Charles did a great job of enhancing the Julia Rings by Relsoft example and I thank both of you for the effort. I always hated that spasmodic white blotch on my screen. Now enjoy this hors concours submission of pure GDI beauty with extra coloration, random placement, and more pleasing resolution and speed. Fixes are minimal and can be easily ported anywhere.